Welsh Slate - Grand Slam Six Nations 2019 Commemorative Coaster Set of 6 Size approx: 85mm across Each slate coaster has a backing. Comes in a presentation box. Mugbys ~ Wales Grand Slam Champions 2019 ~ Welsh Rugby Mug 11oz international standard. Size: 8.2 x 9.6cm. Please note that these mugs are dishwasher and microwave safe but to prolong the life of the mug, hand washing is recommended. I am writing this email to praise the wonderful service I received from your company recently. I ordered a Welsh LoveSpoon in the early hours of Wednesday morning (00.13am) and I was kept informed on a regular basis on the status of my order throughout the day. I have received my package this morning and was amazed at just how fast, efficient and reassuring your delivery service is. The LoveSpoon I ordered is fantastic, and I know that my partner will love it. I will most certainly be using your website again, recommend you to friends, and if I am in the area I will definitely drop in to your shop. Thank you and I look forward to ordering from your website again. Come to Welsh gifts for the best in modern and traditional Welsh clothing and much, much more! 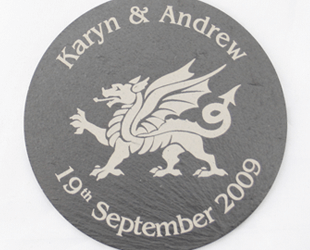 Based in the picturesque market town of Abergavenny, Welsh Gifts is a family owned and operated company. Our customers love the friendly atmosphere and helpful service they get in our store, which you can now experience online. We have a massive collection of items for all the family; some traditional, some contemporary, some a little cheeky, and many surprising! You'll find wonderful Welsh love spoons, traditional Welsh clothing and an incredible array of amazing present ideas. Celtic gifts for men and women include incredible jewellery, with Welsh cufflinks or items that feature designs such as a silver Celtic cross. Welsh spoons are very popular, being one of Wales most famous traditions. 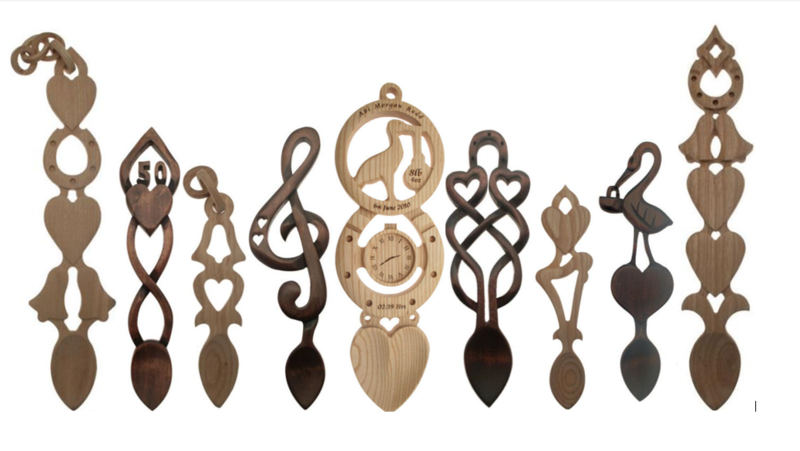 Choose from a wooden or pewter lovespoon that can be given for a range of different purposes. A lovespoon from Welsh Gifts can be given to that special person as a token of love, or you can offer it as a charm of good luck for a new home. These Welsh spoons feature different designs and motifs to signify all kinds of things. Choose a Welsh spoon to celebrate a wedding, a new baby or congratulate a graduation. From traditional Welsh spoons to traditional Welsh clothing - there's a great choice of national dress for children. Your kids will look so cute in our great costumes and outfits to make them really look the part. We also have some great Welsh clothing for adults too, with Welsh t-shirts for ladies and gentlemen that feature great graphics and slogans to wear with pride! You will also find a superb selection of sports themed Welsh shirts that feature national colours and the classic red dragon of Wales. At Welsh Gifts, we stock a series of attractive clothes for all the family. Choose from stylish or humourous t-shirts and shirts for adults and children, and give the ideal gift from our brilliant range. Each garment is made to a very high standard, and represents this proud nation wonderfully! You'll also find a big collection of hats, scarves and badges, with a few whimsical items in there too. 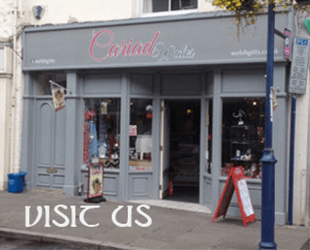 Our Welsh souvenirs and gifts include beautifully made jewellery and accessories. Stunning pieces like a silver Celtic cross, or Welsh cufflinks, really make wonderful surprises for your nearest and dearest. Elegant designs and smart creations ensure that our range is truly unique. You only have to look at the high quality giftware at our online store for inspiration. Come and take a look at our wonderful gifts from Wales, from our wide range of love spoons, Welsh clothing and more. Sophisticated ornaments, figurines, wallets, novelty items and plenty more besides are in stock and ready to ship. There's so much to see at Welsh Gifts, along with a few bargains too. 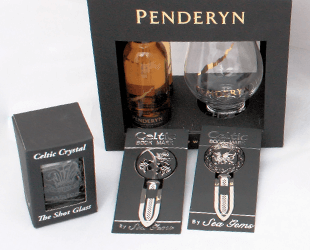 There are even celtic gifts made from the Welsh countryside itself! If you have any enquiries, please do get in touch using the details on our Contact us page. We have customers that shop from far and wide, and we'd love to hear from you.